Have you ever been frustrated with container displays that fall flat? 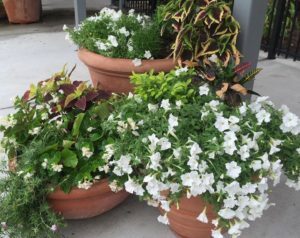 Come learn how to assemble show-stopping seasonal containers, with a heavy focus on vibrant summer annuals. MFBG Senior Horticulturist Katie Dickson will lead the class in a discussion on the basics of design and the best-performing plant varieties. Each attendee will make a gorgeous container garden to take home. Wear clothes you can plant in. Katie designs, plants and maintains all the containers in downtown Lake City and many at Moore Farms Botanical Garden. She’s an expert, so don’t miss this opportunity! Join us on Saturday, June 22, 2019 from 9:30AM-Noon. This class is just one in a Colorful Year series, which includes ColorBlast with Perennials and Winter Color. A Colorful Year Package (all 3 classes) is $45. One class is $20.